If you ticked the ‘Receive special offers and news via e-mail’ box, you will be sent e-mails with special offers, new products etc. from time to time. If you did not tick this box we will not use your e-mail address to send you any promotional material, only to update you on the status of the order. When does Costume Direct disclose the information it collects to outside parties? 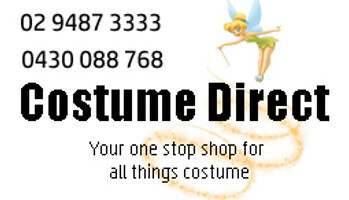 Costume Direct does not sell, trade, or rent your personal information to others. Costume Direct may release customer information when we believe, in good faith, that such release is reasonably necessary to (i) comply with law, (ii) enforce or apply the terms of any of our user agreements or (iii) protect the rights, property or safety of Costume Direct, our users, or others. How does Costume Direct protect customer information? When you place online orders, we use a secure server. The secure server software (SSL) encrypts all information you input before it is sent to us. Furthermore, all of the sensitive customer data we collect is protected by several layers of encryption and several layers of security to prevent unauthorised access. Credit Card Details All credit card payments are processed securely through the SecurePay Payment Gateway and ANZ. Payment by credit card is the fastest way to receive your order as there is not clearance delay. Costume Direct does not store any credit card information on our servers. Our payment options available are safe and secure. We offer Credit Card processing and PayPal payment. Credit Card payments are made directly through DirectOne's 128 bit SSL Encryption software to insure your personal details are kept safe. None of your payment details are stored, this ensures you will be happy with your transaction.